Eric's recorded birthday readings have been increasing in popularity and getting rave reviews for a few years now. This season, we've begun offering something special -- a live session where you can speak with him about your reading. At 8 pm EDT on Tuesday, June 10, Eric will host a conference call and field your questions. Usually very few people participate in the actual dialog -- most just listen -- so you'll actually get to speak with him. You still have time to order your Gemini reading and participate in the question and reply session. Already a best-seller, this in-depth forecast for the coming solar year will take you far beyond your birthday. You'll get relevant, easy-to-follow information about the unusual Mercury retrograde about to happen in Gemini, the highly unusual grouping of planets working their way across your relationship angle, and what it could possibly mean to have the planet Chaos in your sign. You may listen to a free audio preview of the reading here. Eric's readings work on any player or type of computer. And the live session will be archived, so you'll be able to hear it even if you cannot participate at the time. One listener has already told Eric, "Wow, what an amazingly insightful reading you've done for Gemini! I am stunned by your seeming x-ray ability to see into the soul's unfolding growth. Your insights are tremendously valuable, especially your clarity around healthy versus unhealthy chaos." Don't miss your chance to talk with Eric! 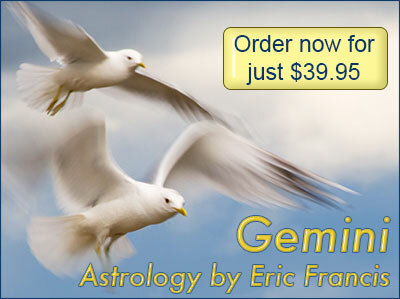 Get instant access to your Gemini reading (and tarot reading) for only $39.95 now.